System which informs the driver when the next service is due, in accordance with the manufacturer's servicing schedule. - the time elapsed since the last service. When the ignition is switched on, no service information appears in the screen. For 5 seconds after the ignition is switched on, the spanner symbolising the service operations comes on. The distance recorder display line indicates the distance remaining before the next service is due. Example: 1 700 miles (2 800 km) remain before the next service is due. 5 seconds after the ignition is switched on, the spanner goes off ; the distance recorder resumes its normal operation. The screen then indicates the total and trip distances. Example: 560 miles (900 km) remain before the next service is due. 5 seconds after the ignition is switched on, the distance recorder resumes its normal operation. The spanner remains on to indicate that a service must be carried out soon. For 5 seconds after the ignition is switched on, the spanner fl ashes to indicate that the service must be carried out as soon as possible. Example: the service is overdue by 186 miles (300 km). 5 seconds after the ignition is switched on, the distance recorder resumes its normal operation. The spanner remains on . The distance remaining may be weighted by the time factor, depending on the driving conditions. Therefore, the spanner may also come on if you have exceeded the two year service interval. 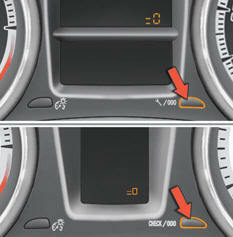 when the instrument panel central screen indicates "=0" , release the button; the spanner disappears from the screen. Following this operation, if you wish to disconnect the battery, lock the vehicle and wait at least five minutes for the zero reset to be registered. This information appears, depending on version, when running through the manual check procedure. Briefl y press the ".../000" button on the right of the instrument panel. 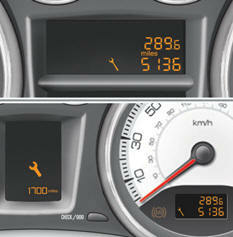 The service information is displayed for a few seconds on the instrument panel central screen, then disappears.